FILE - Zimmerman at IfNotNow demo outside the office of the Conference of Presidents of Major American Jewish Organizations on July 25, 2014 reading the Mourner’s Kaddish and the names of the Israeli and Palestinian victims of the 2014 Gaza War protesting their support for the war and ongoing occupation. New York - Two days after being named as the national Jewish outreach coordinator for the Sanders campaign, a left wing Jewish political activist was suspended yesterday pending an investigation into vulgarity laden remarks about both Democratic presidential candidate Hillary Clinton and Israeli Prime Minister Benjamin Netanyahu. 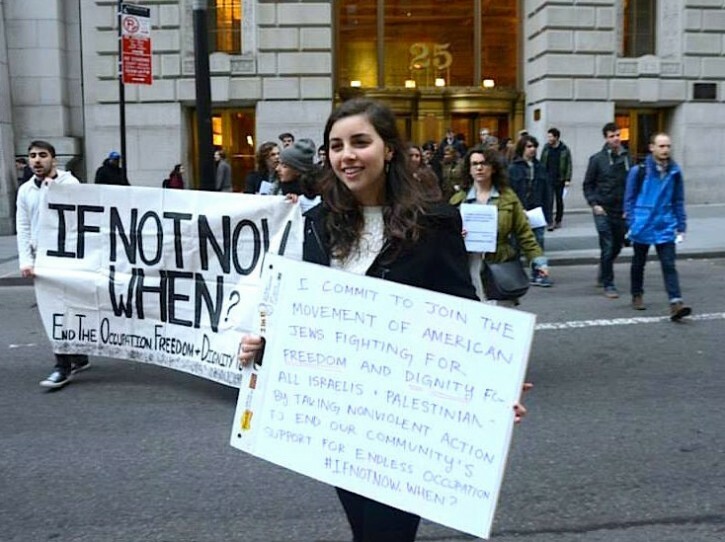 Simone Zimmerman, a well known liberal anti-activist and BDS supporter, was the national president of the student branch of J Street during her time at the University of California. She began a grass roots movement of her own that sought to prevent American Jewish groups from supporting Israeli activities in the occupied territories, attracting the support of thousands of young Jewish adults as well as the attention of Bernie Sanders who hired her as a Jewish liaison on Tuesday, an appointment that lasted just hours after the Washington Free Beacon released screenshots of Ms. Zimmerman’s Facebook page. An expletive-laden March 2015 post by Zimmerman about Netanyahu described him as “arrogant, deceptive, cynical, manipulative,” according to The New York Times. The same post continued in a more aggressive tone, sharply criticizing Netanyahu for sanctioning “the murder of over 2,000 people this summer.” Another post written after Sanders clinched the New Hampshire primary offered both criticism and a vulgarity when referring to Mrs. Clinton. Zimmerman’s dismissal came shortly before Sanders and Clinton faced off on Thursday night in Brooklyn, in a move that was seen as a mechanism for appealing to Jewish voters in Tuesday’s New York primary. While Sanders may be the most successful Jewish candidate to have ever launched a presidential campaign, Mrs. Clinton is still believed to have a commanding lead in the Jewish community. Among those who called for Sanders to drop Ms. Zimmerman were Abe Foxman, president emeritus of the Anti-Defamation League, and Malcolm Hoenlein, executive vice president of the Conference of Presidents of Major Jewish Organizations. Hoenlein’s office was just one of the locations targeted by Ms. Zimmerman for anti-Israel demonstrations. Ms. Zimmerman’s firing for her controversial remarks was a step in the right direction for Sanders, according to Hoenlein. “The fact that he acted shows that he obviously didn’t think it was acceptable,” said Hoenlein. Simone, You are a complete idiot. I dear you to walk in the streets of Gaza and see how friendly your fellow Palestinians are. Or even better try marrying one of them. Then lets see how good and peace loving they are. But I suspect wihtin six months that organization that saves jewish girls stuck in Palestinian marriages (Yad lachim I think its called) will be coming to save you. What a waste of votes! Hope Jews have more brains than vote for this anti-Semitic madman. After hearing what that communist said about Israel how can any bleeding heart Jew vote for him ? Brothers , remember that when the jews left egypt in haste ,a great mixed multitude of camp followers went along full of discontent and hatred of jews. So today we have a large group of ,''mixed multitude'' full of hatred for their own people. Im voting for Sanders and wont follow the Aguda's lead in supporting Hillary. Then you are just as stupid as I thought. Someone needs to educate Sanders with facts from the Summer of 2014.... a constant assault of rockets aimed and landed in areas full of civilians, men, women and children. Any nation is entitled to self defense. If the enemy is so corrupt that they are willing to risk the lives of their population, leaders in free countries need to call them out on that. Sanders is asleep at the wheel.